Urban climate action champion Debra Roberts said the new global strategy for the world's cities needs a stronger focus on implementation if it is going to be effective. Roberts was delivering the 2016 Barbara Ward Lecture: watch the entire lecture as live and read the event coverage. The 2016 Barbara Ward Lecture was live streamed, and each of the three sessions – the introduction by IIED director Andrew Norton, Roberts' lecture, and the question-and-answer session – can be viewed above or on IIED's YouTube channel. Roberts heads the Sustainable and Resilient City Initiatives portfolio in eThekwini Municipality, Durban, South Africa. She delivered the 2016 Barbara Ward Lecture in London on 11 October, 2016. The event took place a few days before the start of Habitat III, the United Nations' first global urbanisation conference for 20 years. The UN summit was to agree a 'New Urban Agenda', setting out proposals for urban development over the next 20 years. Roberts said the draft New Urban Agenda suffered from "a policy-reality disconnect". She said the document was filled with laudable aspirational statements – but these were not going to get the job done. She said: "You're going to need very clear implementation pathways that are direct, that are concrete, that are resourced and very often targeted at our small- and medium-sized cities, where the real challenges lie." Roberts said implementation would require an understanding not only of the formal aspects of cities, but also of informal spaces and communities. She said: "We're really going to have to start looking at those unplanned spaces, the spaces where people are building the city from below. "We're going to have to figure out ways of getting resources to those particular communities, to increase their level of agency, to increase the sustainability of what it is that they're doing. "We're going to have to reach out not only to science, but also to indigenous knowledge to help us understand the role of natural ecosystems in improving the adaptive capacity of cities around the world." Roberts said people working on urban environments would need to examine the way cities were governned. She said: "We are certainly going to have to reimagine forms of government that allow everyone to come to the table, across all scales, local through international, across horizontal barriers, in order to talk about the past the present, and indeed the future of our city." Roberts began her career as a biologist, but in 1994 moved into local government as Durban's first environmental manager, dealing with biodiversity and climate change issues. She now leads the Sustainable and Resilient City Initiatives portfolio in Durban, reporting to the city's chief strategy officer. In the international arena, Roberts is lead author of Working Group II of the Intergovernmental Panel on Climate Change's (IPCC) Fifth Assessment Report. She is also currently co-chair of Working Group II for the IPCC's sixth assessment cycle. Answering a question about technology's potential for mitigating climate change impacts, she cautioned against invoking technology as the default response to climate change. She said: "To be honest, I get really frightened when people give me questions that have technology in it because I'm increasingly seeing, particularly in the climate change debate, that – given the urgency that we are facing – we seem to be defaulting to technology as the response. "For many of the cities around the world technology is simply not the answer." She said it was predicted that by 2050, more than two billion extra people would be living in cities. Most of those new urban residents would be living in Asian and African cities that looked nothing like London. She said: "They are going to be small, going to be informal, going to be off the grid. And so to me the really exciting response, the ability to bend the curve, is to make those cities different. "And I suspect that while technology may play a role, it's going to be much more about rebuilding social cohesion, getting people to work together to use more sustainable approaches, the use of natural ecosystems, localising food production, protecting catchments." In an interview with IIED ahead of her Barbara Ward lecture, Roberts described herself as a 'boundary person', straddling the worlds of science, practice and policy. This role has placed her at the nexus of global development issues at a time when the world is trying to juggle the challenges of rapidly growing cities, diminishing natural resources and a changing climate. You can follow the as-it-happened coverage of the 2016 Barbara Ward Lecture with IIED's Storify round-up. 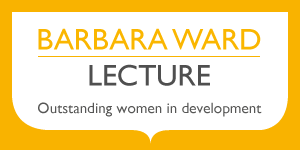 IIED's Barbara Ward Lectures celebrate outstanding women in development. They are organised in honour of the institute's founder, a renowned speaker whose lectures influenced audiences around the world. Barbara Ward pioneered work on linking environment and development, and IIED has been engaging with urban issues since the 1970s. Our Human Settlements research group works on urban environmental issues at all levels – from grassroots partnerships to global summits. Our Urban Matters blog focuses on urban poverty, climate change in cities and rural-urban linkages.